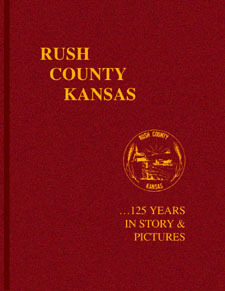 Rush County...125 Years in Story & Pictures contains over 250 pages of stories and photographs that tell the story of Rush County, Kansas. From prehistoric times when Kansas was part of a great inland sea, through the county's tumultuous formative years, up to the beginning of the new millennium, Rush County...125 Years in Story & Pictures recounts the hardships and joys of the lives of residents of Rush County in western Kansas. The book includes previously unpublished research on the Fort Hays-Fort Larned Trail which transverses central Rush County in a north-south direction. Also known as the Hancock Trail, it served as a mail and supply route from Fort Hays and Hays City, situated alongside Big Creek to Fort Larned some fifty miles southeast of Fort Hays. A few other topics in the book include: stories of life on the plains; how the railroads affected growth and decline within the communities of Rush County, how farmers' cooperatives grew into million-dollar industries, social life in good times and bad, and the story of the county seat fight between LaCrosse and Rush Center which was dubbed the "courthouse on wheels." Also included are histories of each of Rush County's twelve communities which encompass a variety of ethnic cultures. Rush County...125 Years in Story & Pictures is a "must-read" for anyone interested in the history of the great plains. Whether or not you have roots in the area, the stories and descriptions will transport you through time and make you feel a kinship to the settlers and residents of Rush County, Kansas. This hardcover keepsake edition, permanently bound in a leather-like cover will be an heirloom for generations to treasure in the years to come. Yes, I would like to purchase the hardcover edition of Rush County...125 Years in Story & Pictures at a price of $40.00 $25.00 each plus shipping. Important Instructions: Enter the information in the appropriate blanks, then print a hard copy of the form and mail with your payment to the address at the bottom of the form. To expedite delivery of the book, we request that you send payment with your order. Sorry, the form cannot be transmitted on-line. Proceeds to benefit Rush County Historical Society preservation efforts.